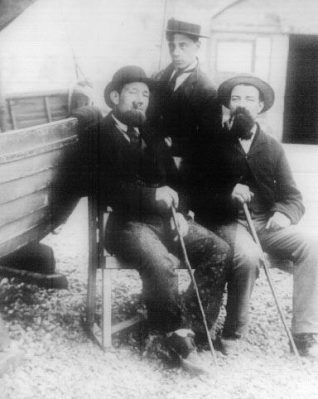 My great grandfather, John Hollingdale, (seated left in photo) was a sailmaker and had his yard in Brighton. Family legend has it that he had a very large yacht in which he was shipwrecked off Brighton pier. Being illiterate, he signed away his large fortune and, by the 1881 census, he was living in London’s East End, working as a stationary engine driver at a brewery. Since posting this I have discovered that John Hollingdale had had enough of sail making by the time that he was 30. He saw the future in steam power and became a stationary engine driver. He worked for many years keeping the plant working at the City of London Brewery, next door to Cannon Street railway station. He died in 1916 in Poplar, London, England.